An electrocardiogram (pronounced ee-lek-troe-KAR-dee-oh-gram) is a recording of the electrical activity within the heart that is obtained by placing various electrodes on the skin surface. From this painless, quick, and inexpensive test, doctors are able to evaluate a person's heart rate and rhythm and to detect if something is wrong. An electrocardiogram, better known as an EKG or ECG, is a common test doctors use to obtain information about the overall health of a patient's heart. Using a machine called an electrocardiograph, the physician is able to see a real-time image of the electrical activity going on in the heart. Usually the doctor examines a printed pattern of heart activity that is recorded on a moving strip of paper, but he or she may also view the pattern on a television-like screen. By examining this pattern of waves, the physician views an actual picture of the heart's rhythm and can then detect many heart problems. Since a normal, healthy heart makes a specific pattern of waves, a damaged or diseased heart changes that pattern in recognizable ways. Simply by examining the EKG, a physician can detect and analyze something like an abnormal or irregular heart rhythm known as an arrhythmia (pronounced uh-RITH-mee-uh). The physician can also identify areas of the heart muscle that have been damaged by coronary heart disease, high blood pressure, rheumatic fever, or birth defects. A previous heart attack will also show up on the pattern, and follow-up EKGs will show if the heart is recovering from it. An EKG also may be used to determine the effect of certain drugs on the heart, and is sometimes used to test how an implanted pacemaker is working. Physicians have not always been able to learn so much about the heart by viewing a simple printout of its electrical activity. The technique known as electrocardiography (pronounced ee-lek-troe-kar-dee-AH-gruhfee) was first reported in 1901. In that year, Dutch physiologist William Einthoven (1860–1927) published a report documenting his invention of what was called the "string galvanometer." Einthoven was able to design such a device more than a hundred years ago because scientists knew by then that there was some sort of electrical activity going on in the heart. Earlier research done by Italian anatomist Luigi Galvani (1737–1798) and Italian physicist Alessandro Volta (1745–1827) had proven that electricity does exist in living tissue. Although many had tried before him, Einthoven was the first to devise the best method for recording the electrical activity of the heart. Although Galvani was able to demonstrate with his 1794 experiments the existence of electricity in living tissue, it was not until 1834 that anyone was able to record and measure that force. Even then, however, another three generations would pass before Einthoven was able to construct a reliable, practical system. The first EKG was introduced to the United States in 1909, and in 1924, Einthoven was awarded the Nobel Prize for physiology or medicine. Both Einthoven's system and the one used today are based on the fact that each time the heart beats, it produces electrical currents. It is these currents that actually make the heart contract or pump the blood that each cell in the body needs to stay alive and do its work. Arrhythmia: An irregular beating of the heart. Depolarization: The tendency of a cell membrane when stimulated to allow ions to enter or leave the cell. Ion: An atom or groups of atoms that carries an electrical charge—either positive or negative—as a result of losing or gaining one or more electrons. In fact, every muscle and nerve cell is capable of producing a tiny electrical signal through a process called "depolarization." This means that in each cell, charged atomic particles called positive and negative ions are moving in and out of its membrane, and it is this movement that creates electrical currents. Therefore, an EKG is not a measurement of the heart's muscular activity but rather a measurement of the flow of ions (or the electrical current) through the membranes of the heart muscle before it contracts. Since a person's body is made up mainly of salty water, it is an excellent conductor of electricity and these currents can be detected at the surface of the skin. 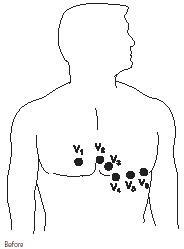 Before an EKG is taken, electrodes or conducting plates are attached to the skin in certain areas. The electrodes are then connected by wires to a meter that boosts or amplifies the impulses, either recording them on a piece of paper using a pen attached to the meter or displaying them on some sort of monitor. During an EKG, a patient will usually have electrodes connected at both wrists and ankles as well as at six other points on the chest, roughly over the area of the heart. The electrodes are attached to the skin with sticky pads or suction cups. Sometimes a gel that helps conduction is applied to the skin before the electrodes are attached. Each of these electrode wires or "leads" is connected to the meter or the recording part of the EKG machine, and each wire registers a pattern of electrical impulses and displays it on a graph. From the patient's point of view, he or she is usually lying down and is asked to remain still while the leads are attached as well as for the duration of the test. The entire recording is usually completed in five to ten minutes and requires nothing more of the patient. This test is painless, noninvasive, and it has no associated risks. There is absolutely no danger since the electricity involved comes from the patient's own heart, which then flows into the machine. No electricity ever passes from the machine into the patient. Whether recorded on a paper graph or on a monitor, the wavelike image produced is usually a small blip followed by a big blip. Although this pattern may look the same to the average person, the informed and trained eye of the professional can tell a great deal about the patient's heart according to how that pattern differs from the normal pattern. have to go to a doctor's office for a stress EKG, resting EKG machines are small and portable and can be done in the home by a technician. 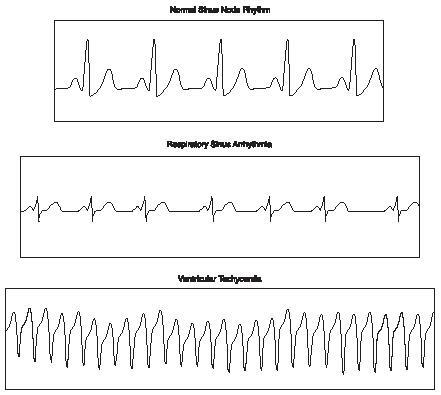 EKG data can also be transmitted by using radiotelemetry techniques. Also called a transtelephonic EKG (pronounced tranz-tell-eh-FON-ik), this technology allows outpatient heart data to be transmitted to a hospital or wherever a doctor chooses. records the patient's EKG pattern. The monitor is sometimes worn for as long as forty-eight hours. The patient is also asked to keep track of any unusual activities or even emotional states that might affect his or her heart's rhythm. Your electrocardiogram rhythm chart is an excellent chart as i found it on google, but it is difficult to read the writing!